Are Palm Trees Native to Los Angeles? Although the palm tree has come to be symbolic of Southern California, the only truly native palm is the California fan palm or Washington palm (Washingtonia filifera). All other varieties were originally imported. Southern California saw a huge surge in palm plantings during the 1920s and 1930s, many of which still line Los Angeles streets today. 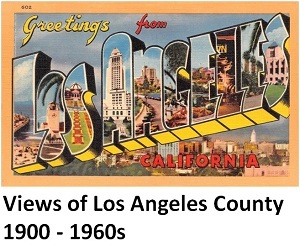 Source: Los Angeles A to Z by Leonard & Dale Pitt. The oldest known palm tree in Los Angeles is a Mexican Fan Palm believed to have been uprooted in the desert in the 1850s and replanted on San Pedro Steet in Los Angeles. It was replanted again at Fifth and Central Avenue and, then yet again in 1888 (after a public effort to save it), to its current location at the Figueroa Boulevard entrance to Exposition Park. Oldest palm tree in Los Angeles, now at Figueroa Boulevard entrance to Exposition Park (view facing Figueroa). Los Angeles Almanac Photo. Plaque at foot of oldest palm tree in Los Angeles. Los Angeles Almanac Photo.